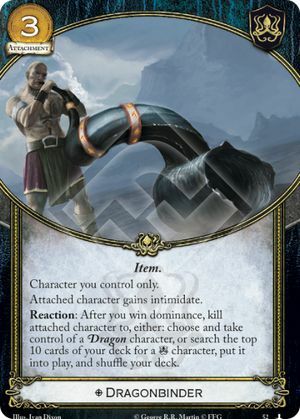 Reaction: After you win dominance, kill attached character to, either: choose and take control of a Dragon character, or search the top 10 cards of your deck for a character, put into play, and shuffle your deck. Streets of King's Landing #52. Preventing a cost from being paid does not count as initiating the ability; if the attached character is saved, you may attempt to trigger the reaction again (after your opponent initiates a reaction to the triggering condition or passes).